Japan is a land of mystery. It’s about the size of California, but has over 120 million people. Almost everybody is Japanese, and can trace their ancestry back for centuries. Part of the reason is the country’s isolation. It is made up of thousands of islands scattered on a line from northeast to southwest. 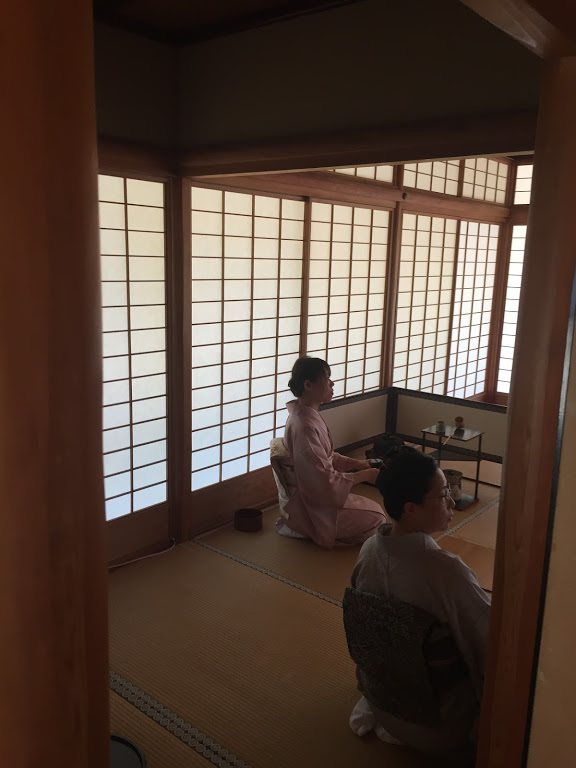 There are five major islands, and today’s trip takes place in the city of Fukui on the south west coast of the largest of the home islands, Honshu. I live in Pittsburgh and work for Westinghouse Electric Co. Most people would agree that this city and that company were responsible for the birth of commercial nuclear power in the world. Westinghouse was contracted by the US government to develop, build and test the nuclear plants that would be used to power the navy’s submarines, aircraft carriers and destroyers. A natural off-shoot of this work was to develop commercial plants which are pretty much the exact same design as their naval counterparts. Westinghouse made quite a bit of hay out of this in the 1950s to the 1980s with about three-fourths of the worlds nuke plants based on the Westinghouse design. 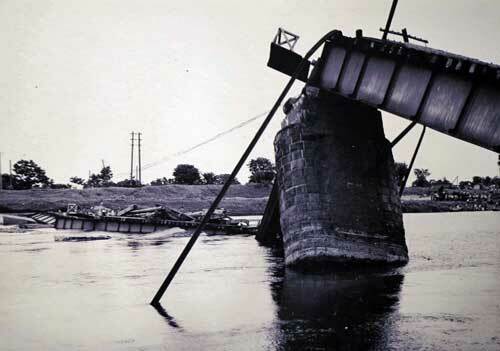 They built the first commercial station at Shippingsport on the Ohio River just west of Pittsburgh, followed closely by over 100 plants in the US and 400 world-wide. 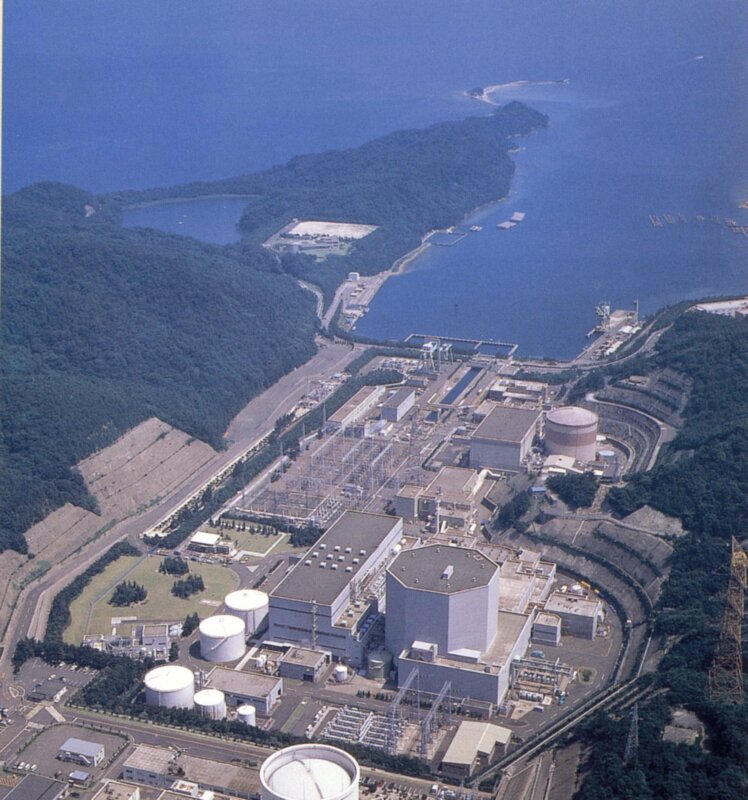 Japan was an early convert to nuclear power with first plants built in the 1960s. 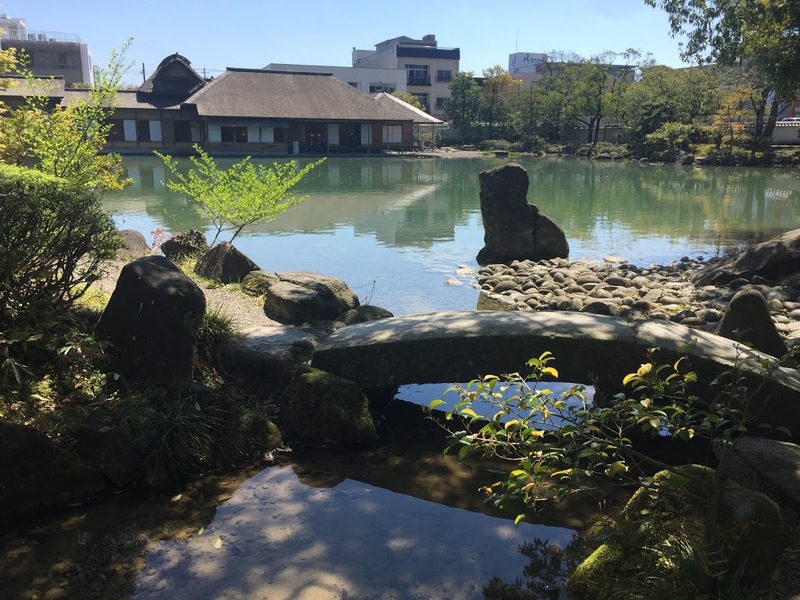 The birthplace of the nuclear industry in Japan was the Prefecture of Fukui, so it was an obvious choice to hold an international conference there, the 2017 International Congress on Advances in Nuclear Power Plants, or ICAPP (somehow, they left out the “N”. You’d think that would be important). 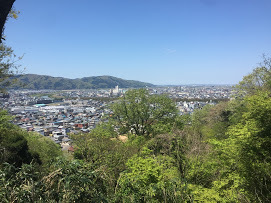 Actually, they split the conference between Fukui and the much better know venue of Kyoto, which is the subject of another post. Anyway, your intrepid day-tripper was named the Technical Program Chairman from the US for ICAPP 2017, so off to Japan I went. Today we will explore Fukui. Fukui is a vibrant city of about 260,000. 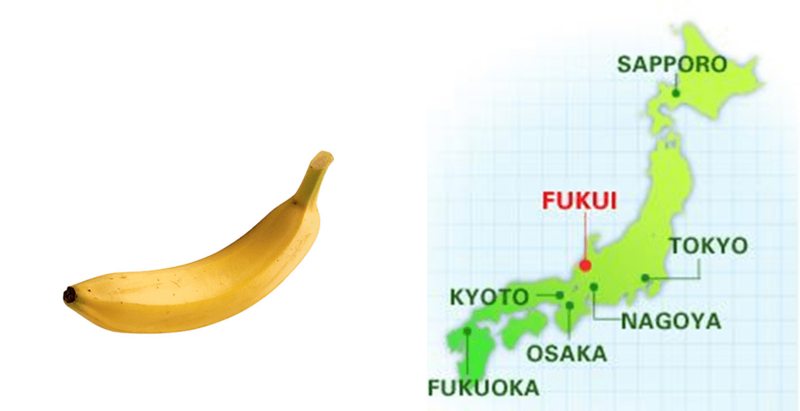 If Honshu is a banana, Fukui is about half-way down in the crook. As an ancient capital, it is very picturesque. Getting here is no mean feat. I flew into Narita airport north of Tokyo 15 hours after a stop in Chicago, then spent the next three hours on trains, finally getting in to Fukui about 30 hours after I left Pittsburgh. Following my own advice, I left a day on the start of my trip to see the city, so after a good night’s sleep, I was ready to go. There are palaces and gardens which I spent the day exploring. It’s not a huge place, so walking is a great way to get around here. All self-respecting Japanese cities have a castle. This dates from back in the ancient days where you had to keep your enemies at bay, hopefully behind a nice deep moat. The freaky thing about the Fukui castle is that they converted it into city buildings after the city was bombed into oblivion in WW2. 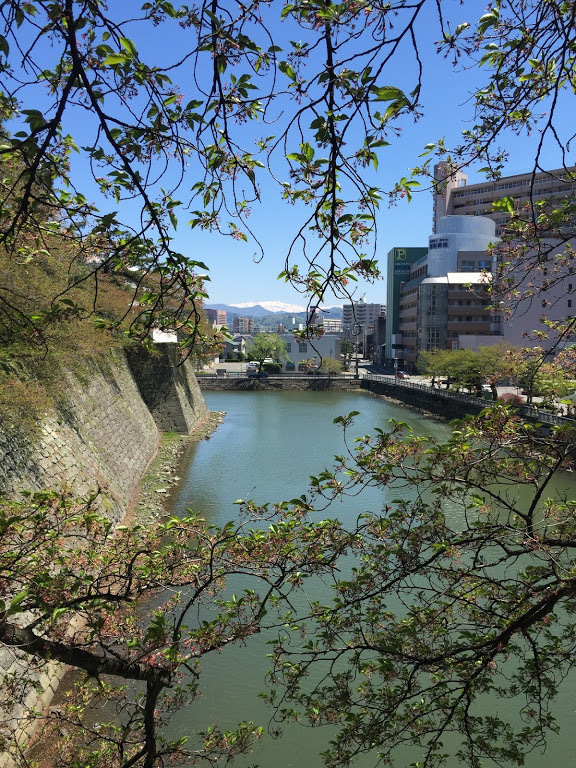 We missed the cherry blossoms by a couple of weeks, but the views from the castle walls of the snow-capped mountains in the distance was pretty nice. 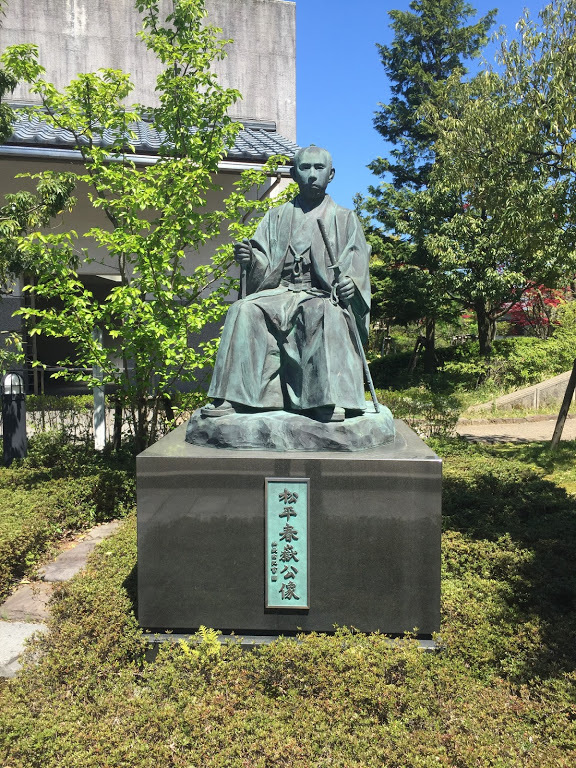 The rulers of Fukui were on display on the castle grounds and the adjacent museums. 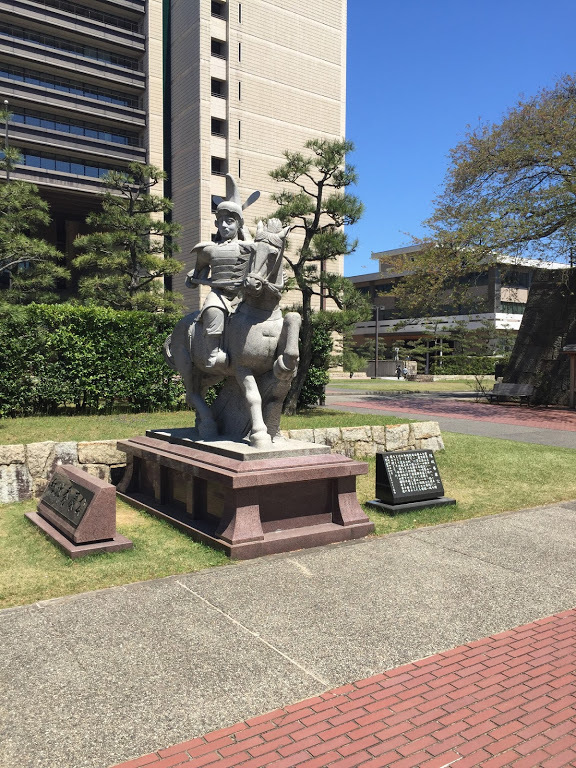 There are the required statues of old kings all over the place. Just outside the castle walls is the old royal guesthouse. 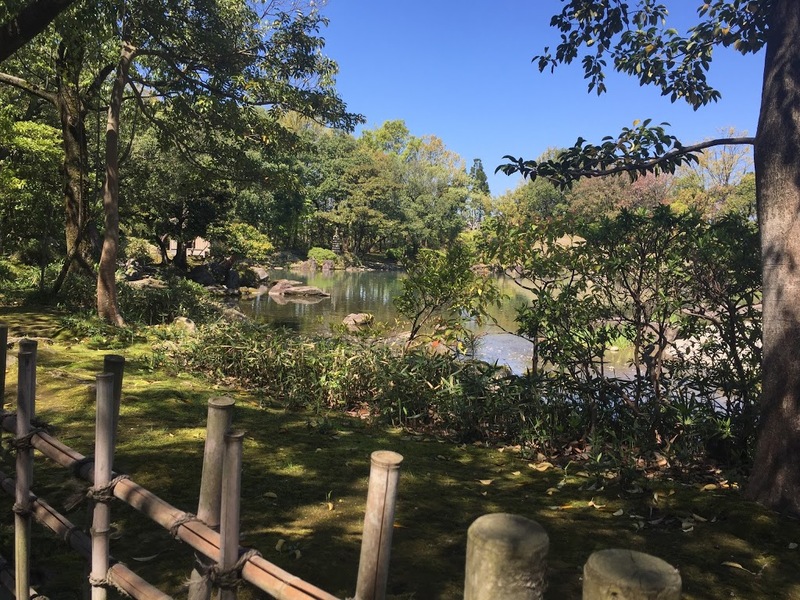 It’s built in the classic Japanese garden style with quiet walks around a koi pond leading to a wooden house where the local samurai used to house his guests. It was flattened during the war, but was rebuilt by the town. It is quite picturesque and well worth the time to visit. You enter from the city streets and soon find yourself in a quiet, serene setting. About a million gardeners are constantly making sure that not a leaf is out of place here. Across the Asuwa River going south the lands starts to rise up. They chose this hill to put a huge television/radio antennae, so it is as high as you can get. Climbing up the road was a challenge, but the views from the top was spectacular. I was lucky enough to come on a gorgeous day, and the view over the city was lovely. On the way up, I passed a cemetery. 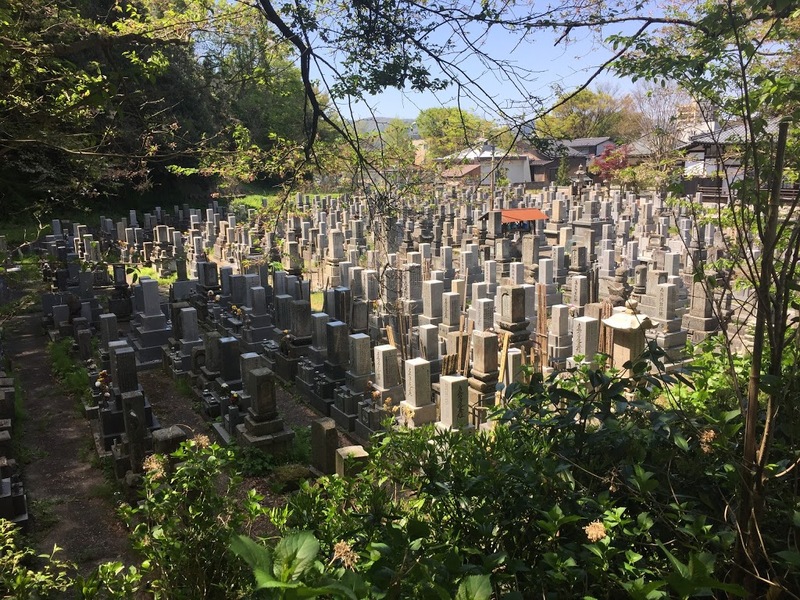 I guessing everybody in Japan gets cremated so they can cram a lot of people in. 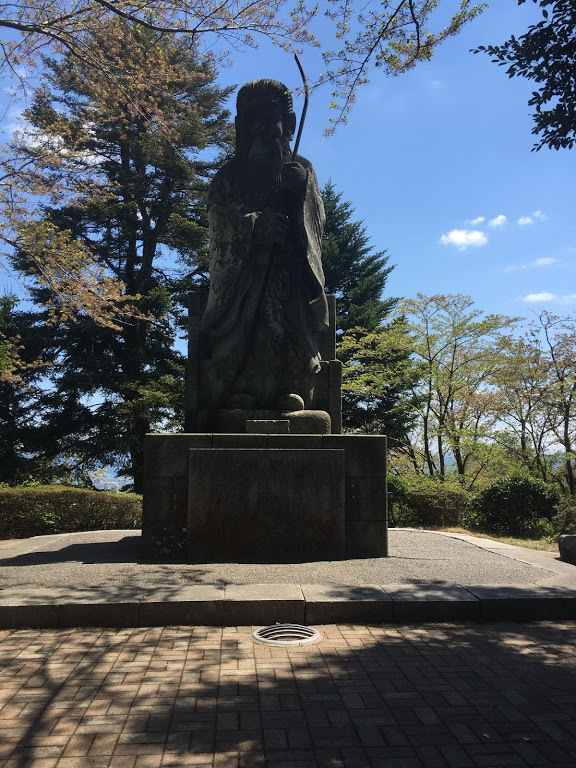 Finally at the top, was a statue of some great Japanese dude. 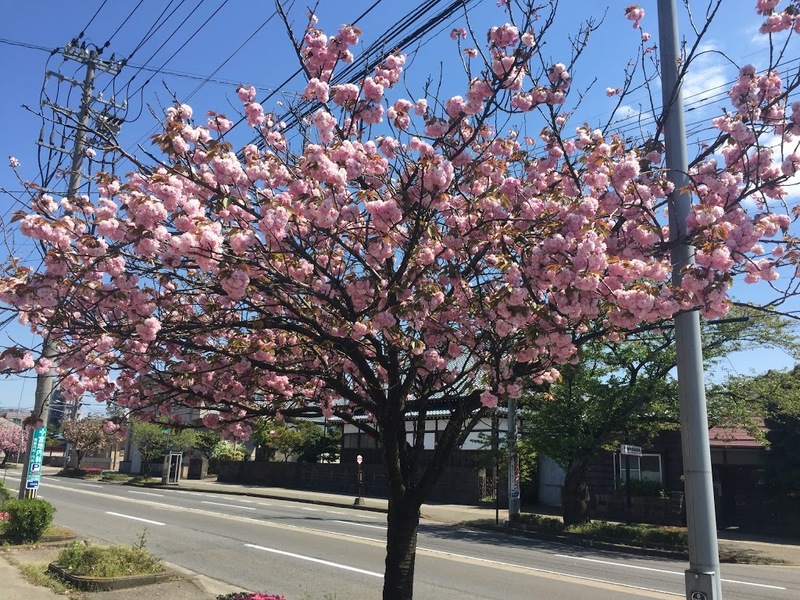 Back in town, we did finally find a cherry blossom tree that was not yet denuded. After a couple of days of meetings on nuclear stuff, we hopped buses for a 4-hour ride to Kyoto. 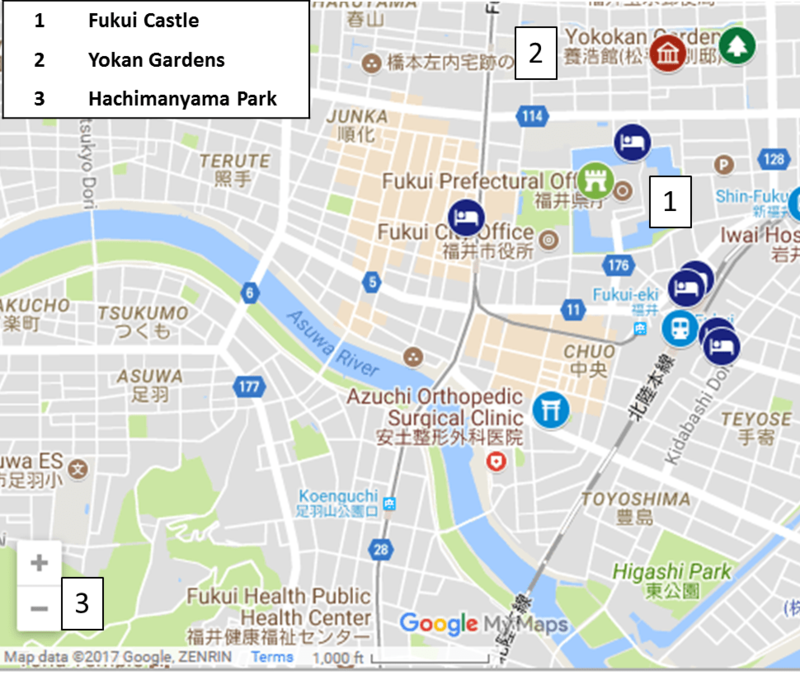 I hope you enjoyed our walking tour of Fukui. It’s a t0ugh place to get to, but well worth the trip.